The Kyoto Imperial Palace (京都御所, Kyōto-gosho) is the former ruling palace of the Emperor of Japan. The Emperors have since resided at the Tokyo Imperial Palace after the Meiji Restoration in 1869, and the preservation of the Kyoto Imperial Palace was ordered in 1877. Today, the grounds are open to the public, and the Imperial Household Agency hosts public tours of the buildings several times a day. The Kyoto Imperial Palace is the latest of the imperial palaces built at or near its site in the northeastern part of the old capital of Heian-kyō (now known as Kyoto) after the abandonment of the larger original Heian Palace (大内裏, Dai-dairi) that was located to the west of the current palace during the Heian period. The Palace lost much of its function at the time of the Meiji Restoration, when the capital functions were moved to Tokyo in 1869. However, Emperor Taishō and Shōwa still had their enthronement ceremonies at the palace. The Palace is situated in the Kyōto-gyoen (京都御苑), a large rectangular enclosure 1,300 metres (4,300 ft) north to south and 700 metres (2,300 ft) east to west which also contains the Sentō Imperial Palace gardens. The estate dates from the early Edo period when the residence of high court nobles were grouped close together with the palace and the area walled. When the capital was moved to Tokyo, the residences of the court nobles were demolished and most of Kyōto Gyoen is now a park open to the public. The Imperial Palace has been officially located in this area since the final abandonment of the Daidairi in late 12th century. However, it was already much earlier that the de facto residence of the Emperors was often not in the Inner Palace (内裏, dairi) of the original Heian period palace, but in one of the temporary residences (里内裏, sato-dairi) in this part of the city and often provided to the Emperor by powerful noble families. The present palace is a direct successor—after iterations of rebuilding—to one of these sato-dairi palaces, the Tsuchimikado Dono (土御門殿, Tsuchimikado-dono) of the Fujiwara clan. The palace, like many of the oldest and most important buildings in Japan, was destroyed by fire and rebuilt many times over the course of its history. It has been destroyed and rebuilt eight times, six of them during the 250-year-long peace of the Edo period. The version currently standing was completed in 1855, with an attempt at reproducing the Heian period architecture and style of the original dairi of the Heian Palace. The grounds include a number of buildings, along with the imperial residence. The neighboring building to the north is the sentō (仙洞), or residence of the retired Emperor, and beyond that, across Imadegawa Street, sits Doshisha University. The Imperial Household Agency maintains the building and the grounds and also runs public tours. The main buildings are, among other halls, the Shishinden (紫宸殿, Hall for State Ceremonies), Seiryōden (清涼殿, Emperor's Habitual Residence), Kogosho (小御所, Court Room), Ogakumonjo (御学問所, Imperial Study or Library), and a number of residences for the Empress, high-ranking aristocrats and government officials. Dignitaries with special permission for official visits used to enter the palace through the Okurumayose (御車寄) entrance. The Shodaibunoma (諸大夫の間) building was used as a waiting room for dignitaries on their official visits to the palace. They were ushered into three different anterooms according to their ranks. The Shinmikurumayose (新御車寄) structure was built as a new carriage entrance on the occasion of the enthronement ceremony of Emperor Taisho in 1915. For state ceremonies, the dignitaries would enter through the Kenreimon (建礼門), which has a cypress-wood roof, and is supported by four unpainted wooden pillars. This gate would have been used on the rare occasions of the Emperor welcoming a foreign diplomat or dignitary, as well as for many other important state ceremonies. Passing through the Kenreimon, the inner gate Jomeimon would appear, which is painted in vermilion and roofed in tile. This leads to the Shishin-den, which is the Hall for State Ceremonies. The Gekkamon is a smaller gate on the west side of the main courtyard. Another gate in the outer courtyard is the Kenshunmon, which has a similar architectural style to the Kenreimon. Located next to the Kenshunmon is a square where the traditional ball game Kemari is played. The Shunkōden (春興殿) was constructed to house the sacred mirror on the occasion of the enthronement ceremony of Emperor Taisho in 1915. The roof is modern in that it is made out of copper and not wooden shingles. 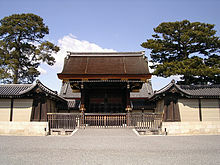 The Shishinden (紫宸殿) is the most important ceremonial building within the palace grounds. The enthronement ceremonies of Emperor Taisho and Emperor Showa took place here. The hall is 33 by 23 metres (108 by 75 ft) in size, and features a traditional architectural style, with a gabled and hipped roof. On either side of its main stairway were planted trees which would become very famous and sacred, a cherry (sakura) on the eastern, left side, and a tachibana orange tree on the right to the west. The garden of white gravel played an important role in the ceremony. The center of the Shishin-den is surrounded by a hisashi (庇), a long, thin hallway which surrounded the main wing of an aristocrat's home, in traditional Heian architecture. Within this is a wide open space, crossed by boarded-over sections, leading to the central throne room. The Takamikura (高御座) is the Imperial throne. It has been used on the occasion of the enthronement ceremonies commencing in 707 in the reign of Empress Genmei. The present throne was modeled on the original design, constructed in 1913, two years before the enthronement of Emperor Taishō. The actual throne is a chair in black lacquer, placed under an octagonal canopy resting on a three-tiered dais painted with black lacquer with balustrades of vermilion. On both sides of the throne are two little tables, where two of the three Imperial regalia (the sword and the jewel), and the privy seal and state seal would be placed. On top of the canopy is a statue of a large phoenix called hō-ō. Surrounding the canopy are eight small phoenixes, jewels and mirrors. Hanging from the canopy are metal ornaments and curtains. The sliding door that hid the Emperor from view is called kenjō no shōji (賢聖障子), and has an image of 32 celestial saints painted upon it, which became one of the primary models for all of Heian period painting. The Michodai (御帳台) is the August Seat of the Empress. The current throne was constructed in 1913. Its colour and shape are the same as the Takamikura, but is slightly smaller and more simple in comparison. The canopy is decorated with a statue of the mythical bird ranchō. The Imperial throne is always placed in the center of the main hall, the michodai to the right of it. Both thrones are kept away from public view through screens called misu. The Seiryōden (清涼殿) sits to the west of the Shishin-den, facing east. It, too, has a hipped and gabled roof, and is primarily cypress wood. Originally a place where the Emperor would conduct his own personal affairs, the Seiryō-den was later used for various gatherings and meetings as well. In the center is an area where the Emperor would rest, and on the east side of the hall, an area of two tatami was set aside for dignitaries and aristocrats to sit. Here was where the Emperor could conduct formal affairs. On the north side of the hall was an enclosed area where the Emperor would sleep at night; later, Emperors began to use the official residence. The west side was set aside for the Emperor's breakfasts, and also contained the lavatories, while the south side was used by the keeper of the Imperial Archives. This area contained paintings by the masters of the Tosa school, and just outside, various rare bamboos were planted. The original structure was built as the Emperor's residence at the end of the 8th century and was used until the 11th century. The Seiryō-den was rebuilt in this location in 1790 CE, on a smaller scale than the original building but preserving the original structure. The Kogosho (小御所) is a place where the Emperor received bannermen under the direct control of the Tokugawa shogun (buke). It was also used for some rituals. This distinctive building shows a blend of architectural elements of shinden zukuri and shoin zukuri styles. The Kogosho Conference was held here on the night of December 9, 1867, the declaration of the restoration of imperial rule (osei fukko). The structure burnt down in 1954 and was reconstructed in 1958. The study hall Ogakumonjo (御学問所) was for reading rites, a monthly poetry recital and also a place the Emperor received nobles. It is a shoin zukuri style building with an irimoya hiwadabuki roof. The Otsunegoten (御常御殿) was used as the Emperor's residence until the capital was transferred to Tokyo in 1869. It is the largest structure of the palace with fifteen rooms. Facing it is the Gonaeitei garden. The Osuzumisho (御涼所) is the summer residence for the Emperor. The Koshun (迎春) is a study hall that was used by Emperor Komei, who reigned from 1846 to 1866. The Omima (御三間) was used for unofficial ceremonies such as the Star Festival and the Bon festival. The Palace's Suzaku-mon (朱雀門) is walking distance from JR Nijō Station. This article is almost entirely a faithful translation of the Kyoto Gosho article from the Japanese Wikipedia. ^ "Visiting Procedures for Foreigners -- Kyoto Imperial Palace". Retrieved 2007-09-12. ^ "ごがくもんじょ【御学問所】の意味 - 国語辞書 - goo辞書". goo辞書. Wikimedia Commons has media related to Kyoto Imperial Palace.